Take inventory of the collection and either make a list, have your child draw each item, or draw them yourself. 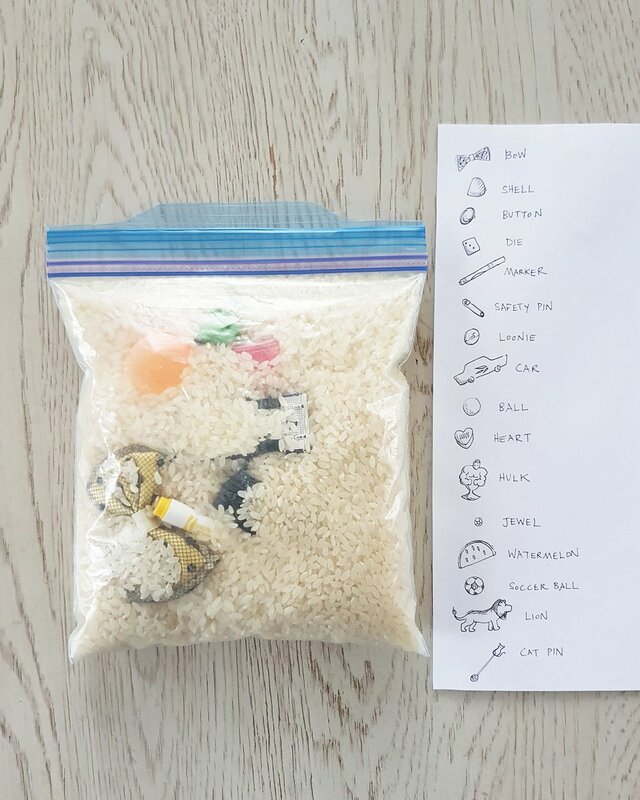 Allow your child to fill the bag with the found items and rice. Seal up the bag and (optional) tape it closed. Play! Let your child see how many hidden items they can check of the list by tipping, shaking, and manipulating the bag. The play can also move the other way around, first deciding on an item on the list and then finding it. Your child will benefit from the creative and sensory components of this 3D take on the classic look-and-find book... and as a parent who could use one less itsy-bitsy thing to step on, you'll benefit by clearing a bit of clutter! 😂 Win win, really.